[Hannah Tamimi | Banner] Aidan Apodaca, junior biology major and forward, defends the ball in a match against Sonoma State University Sept. 8, in which California Baptist University’s team Sonoma 2-1. Apodaca was named the PacWest Player of the Week after his contributions early in the season. 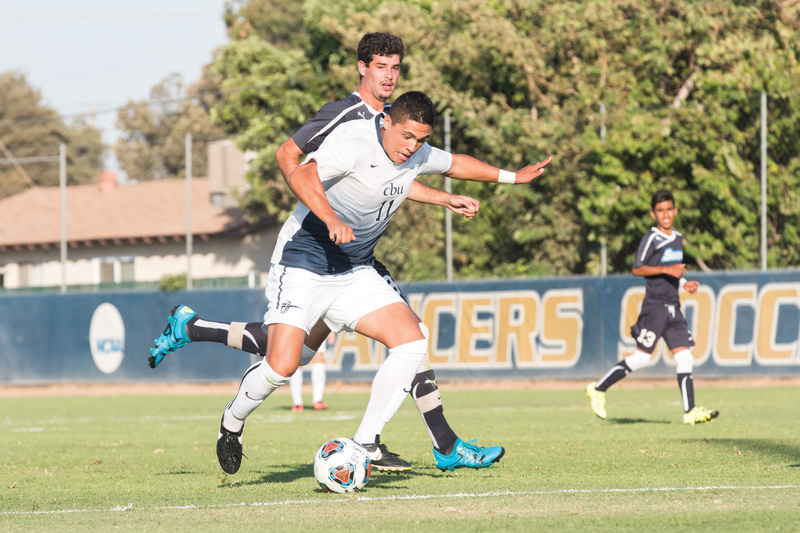 The soccer field is no stranger to Aidan Apodaca, junior biology major and forward on the men’s soccer team at California Baptist University. In the season’s first five games, Apodaca has scored five goals and has seen 229 minutes of play. Apodaca earned a PacWest Player of the Week honor after his performance in a game against Saint Martin’s University Sept. 3, where all three goals were scored by Apodaca, earning the win for the team and a hat trick for the books. Apodaca said in a press release the hat trick was a team effort, despite the accolades. Apodaca finished the game against Sonoma with five shots on goal and a hat trick. Daniel Westholm, junior business administration major and midfielder, assisted Apodaca in two of the three goals while Hugo Gutierrez, junior undeclared major and midfielder, notched the assist to an Apodaca goal. As a freshman, Apodaca was named the 2014 PacWest Freshman of the Year, scoring seven goals on the season. Last season, he recorded three goals on the season despite an injury. Apodaca and the rest of the team holds a 4-1 record on the season and began their PacWest Conference run Sept. 22 against Point Loma Nazarene University.